Created by Robert C. Cooper (Dirk Gently's Holistic Detective Agency, Stargate SG-1, Stargate: Atlantis) and based on first-person experience and non-fiction books, Bad Blood by Vic Parsons and The Gift of Death by Andre Picard, UNSPEAKABLE chronicles the emergence of HIV and Hepatitis C in Canada in the early 1980s and the tragedy that resulted after thousands of people were infected by tainted blood. One of the largest medical disasters in Canadian history, the blood scandal triggered a federal inquiry and precedent-setting lawsuit resulting in billions of dollars in compensation to victims. 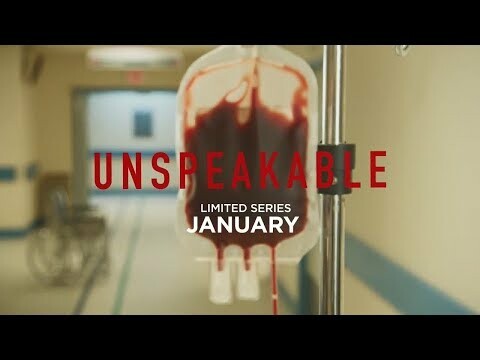 Unspeakable Season 1 was released on SundanceTV 14d ago in the US. Notify me when Unspeakable Season 1 is available.